In this code we move most of the work up into our GPS class. That makes the main part of the program simple and intuitive to use. #This sets up variables for useful commands. 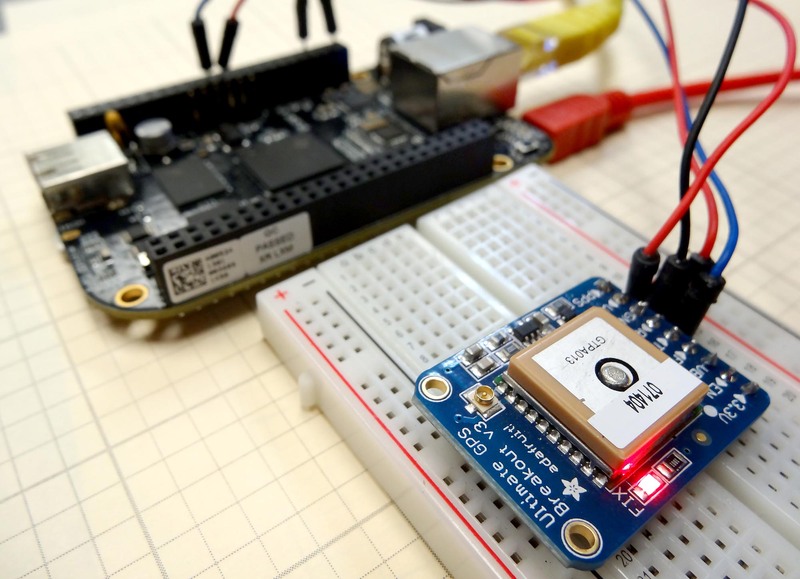 In lesson 1 we showed you how to connect the Adafruit Ultimate GPS breakout board to the Beaglebone Black and how to read the NMEA sentences streaming off the GPS over the UART pins. In this lesson we will show you how to send commands to the GPS to better tailor its operation for our needs. There are a number of commands that can be sent to it. Some of the things we we can control are the baud rate it communicates at, and the rate that it takes and sends data. We can also influence which NMEA sentences it sends. In this video we will go over the different commands we can use. The video explains the code step-by-step, but here it is for your reference. def __init__(self): #This init will run when you create a GPS object. This code sets the GPS to communicate at baud rate of 57600, and set it to read and report 5 readings a second. It then sets the GPS to only report the $GPRMC and the $GPGGA sentences. It then constantly reads and reports the NMEA sentences. 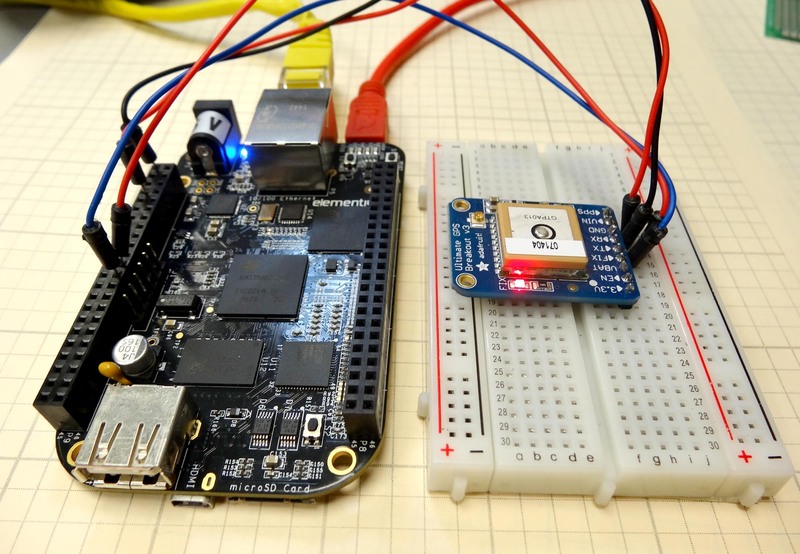 If you went through our series of 12 lessons on the Beaglebone black you should be familiar with the basics of this microcontroller. We are now ready to move on to more advanced projects. 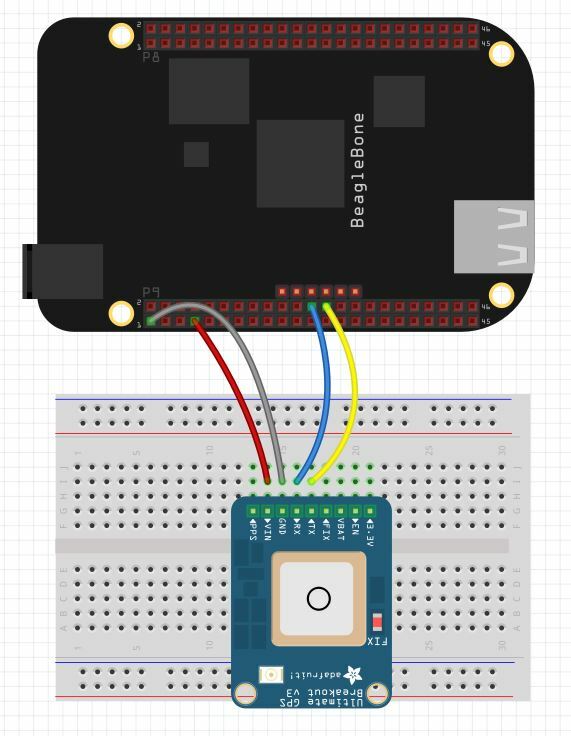 In our earlier lessons on the Arduino, we built a GPS data logger and integrated it with Google Earth using the Arduino Uno and the Adafruit Ultimate GPS Breakout Board. While that was a great project, we finally ran out of horsepower with the arduino, and what we could do was limited by the memory limitations on the Arduino. Also, it is very hard to parse strings in the Arduino IDE, so interpreting the NMEA sentences is a rather large challenge with the limited string functionality in Arduino. Python on the other hand makes quick work of string manipulation and the Beaglebone Black has plenty of horsepower for any manipulation of the NMEA sentences we might want to do. In order to play along with this project, you will need a Beaglebone Black Rev C, which you can get HERE, and the Adafruit Ultimate GPS which you can get HERE. The video below takes you through the project step-by-step, as well as the description below. Note that we are working off header P9 and we are using P9_1 as ground, P9_7 as VIN, we are using P9_24 as Tx and P9_26 as Rx. Please note that you can see a detailed Diagram of the Beaglebone Black pinout HERE. Also notice that Tx on the Beaglebone is connected to Rx on the GPS, and Rx on the Beaglebone is connected to Tx on the GPS. Tx is like “talk” and Rx is like “listen, so you want to listen to the pin that is talking, and you want to talk to the pin that is listening. Our goal in this first lesson is to establish a connection between the GPS and the Beaglebone, and to read in the data streaming from the GPS. We want to get a fix, and verify that we can read and print the NMEA sentences that contain the various position, altitude and velocity data. The video takes you step-by-step through the code. The following simple code will get you streaming data from the GPS to your terminal window. In future lessons we will break the data down and show you how to get your position from the raw NMEA sentences streaming in. This lesson will show how to use Python running on the Beaglebone Black to control the position of a servo. First, I am using a small servo that I have verified can be powered from the Beaglebone Black without drawing too much current. All servos are different, so if you are unsure of the current requirements of your servo, it is safest to power it from an external 5 Volt power source. You can still control it through the control line connected to the Beaglebone Black, just make sure the servo and Beaglebone have a common ground. 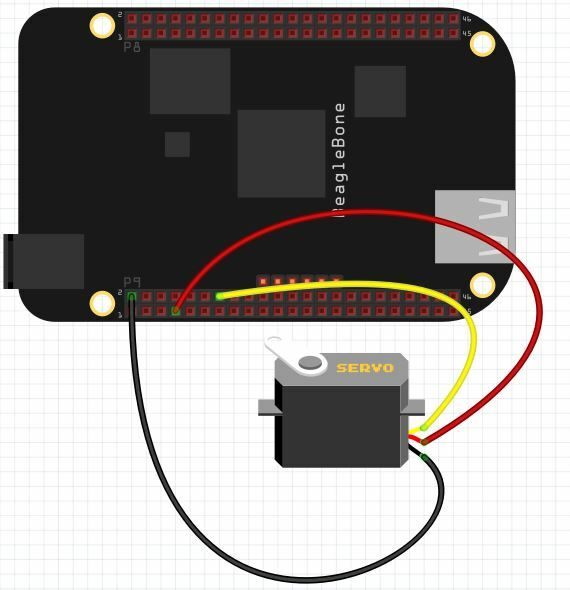 Control of Servo From Beaglebone Black. Most all servos have three wires; Power, Control, and Ground. For my servo, Control is Yellow, Power is Red, and Ground is Black. If you have a different servo, check the data sheet to see what colors are Control, Power and Ground on your servo. Note we are using pin P9_2 as ground, P9_7 as 5V power, and P9_14 as our control pin. We will be controlling the position of the servo using PWM. We will have to play around with our individual servo to determine precisely what signal pulse width will result in the servo being in the full left position, and what pulse width will result in the servo being in the full right position. For most servos, full left is somewhere around 1 milliseconds, and the pulse width that will give us full right position is about 2 milliseconds. These are ballpark numbers, and we will have to play around with things to find the exact values for our servo. period = 1/frequency = .02 seconds = 20 miliseconds. PulseWidth = 20 x .1 = 2 milliseconds. We can use the following code to determine precisely for our servo what dutyCycle will give the precise full left and full right positions. For my servo, running a 50 Hz PWM singnal, I find that a duty cycle of 2% puts it in the full left position and a duty cycle of 12% puts it in the full right position. You can develop the same type equation just using the values suitable for your servo from the experiment above. Now we can use this code to smoothly move the servo to any desired position. In LESSON 10 we showed you how to create a dimable LED using the analog input from a potentiometer. In this lesson we will create a dimable LED using digital buttons. We will say we want a press of the top button to make the LED brighter, and a press of the bottom button to make the LED dimmer. In order to get going, you will need to build this circuit. If you do not already have a Beaglebone Black, you can get one HERE. In this circuit make note that we are using two 1000 ohm resistors as pull down resistors on the push buttons. It is important that these resistors be at least 1000 Ohm each. Next, notice the current limiting resistor on the LED is 330 Ohm. We establish a ground rail on the breadboard from pin P9_2 on the Beaglebone Black. We establish our 3.3 Volt rail on the breadboard from pin P9_4 on the Beaglebone. We will use P9_14 as the PWM pin to control the LED, and we will use pins P9_23 and P9_27 as our digital input pins. We will want a press of the top button to increase brightness and a pres of the bottom button to decrease brightness. As we discussed in Lesson 10, we want to insrease and decrease PWM signal exponentially, as this will allow the eye to perceive a smooth and linear increase in brightness. We now need to fit an exponential curve through these two points. We need to figure out what the constants C and B need to be. Note DutyCycle and BP are our variables . . . they are like X and Y. We can plug our first point in and solve for B. Now put in our second point to calculate the constant C.
With this equation we are not ready to develop our code. The video will step you through the code line by line.